In stockHow long will it take?This item is currently in stock and will be despatched the same day if ordered before 5pm (Mon-Sat) and 3pm (Sun). Guaranteed next working day delivery available for mainland UK. Please allow extra day for Scottish Highlands. Excellent Givi product. Well made and the perfect size for me. Delivered in good time and at a great price. Great box, solid construction, easy to use. I was a little unsure about paying this kind of money for plastic box to sit on the back of my bike, but now I have seen the quality of the Givi top box I understand why, I believe you get what you pay for and this is no exception. Exactly what you'd expect from Givi, good quality kit. Nice finish, plenty big enough for one helmet and other stuff and feels reasonably tough and solid on the bike. Purchased for my NC750x for regular journey from the Midlands to north London and back. I found the various Givi options for racks and plates etc quite confusing but the guys at Sportsbikeshop quickly and accurately helped me out. Order arrived next day and took about half an hour to fit (very simple). The box is great, roomy, waterproof and sturdy. Not intrusive and doesn't affect filtering at all. Very pleased with the whole buying and using experience thanks! Looks great on the bike and useful as it can be used as a top box. Easy to fit to the Givi removable racks. I bought the triple pack of Givi barrels and keys and swapped all my locks over to one key. Has let some rain in so inner bags might be advisable. Top box is right size for my KTM 990 SMT and would not look out of place on any adventure bike. And its good quality and nice looking and not to over priced. Bike specific Givi fitting kit required to fit this case. Available in two versions, with capacities of 46 LT (TRK46N/B) and 33 LT (TRK33N/B), the TREKKER cases are the best solution for bikes equipped with exhausts only on one side. By affixing the smaller case to the side with the exhaust, and the larger on the other, in many cases you can solve the issue of asymmetry (a problem that you might find using traditional panniers). Thanks to special selectors placed inside the cases, you can convert each version to either fully open the entire lid or only the uppermost smaller section furthest from the hinge (very practical for quickly accessing items from the case, avoiding any ill-timed and embarrassing spillage of the entire contents). Elaborately trimmed, these cases are not necessarily specific to just enduro bikes, they can also be a luxurious accessory on the more elegant ones. All this diversity sold in a single unique package, combined with its ability to be used as a top box on the Monokey plates, gives the biker the opportunity to choose the best combination to mount on the bike in order to suit his/her luggage needs. Real passion, Italian design, strong technological ideas and specific knowledge of materials; these are the key factors of the international success of Givi, which led a small factory in Brescia to become the leader in motorcycle accessories. Today, Givi hires nearly 500 employees all over the world, working with the same determination of the first day. Givi's mission is a constant commitment to produce, realise and distribute quality products, which can improve the equipment of the motorbike and bikers themselves in terms of security and technical performances. This engagement is only possible thanks to the team work of Givi, which relies on a sustainable development of the product. Unfortunately Givi no longer list any items for your model year, apologies. Whats the universal top plate needed for this box? Your require Givi part E251. This plate will only fit onto a "BBQ" style rack. Unfortunately Givi no longer offer a fitment for your Tiger, apologies. Sorry, me again, following about my earlier question about the E370NT monolock being able to use the same universal mount as the TRK52N, I see that this comes as a 46 or a 33l option, presumably they would directly fit on the same plate as the TRK52N and I could just decide at the start of my journey which size to have on? Mike. You require a Monokey top plate to fit the Trekker Monokey top cases. Either size will fit a Monokey top plate. Hi. Please can you advise what type of base plate I need to fit this box onto a 2010 BMW F650GS. Thanks in advance. There are two options available - SRA5103 and SR5107 Please see the attached link below - https://www.givi.co.uk/my-motorcycle#BMW,F_650_GS_/_F_800_GS_(08_%3E_17) This will help you look at both options. Givi state that this top case/pannier is only suitable for one flip-up helmet. What fitment do I need for a 2009 Yamaha 660z tenure. You require the E333 rear rack. This Top Case will carry 1 modular (flip front) helmet. You will require the Givi SR7705 or SRA7703 specific rear rack for a KTM 1190 Adventure 2014. The SR7705 kit will require a M5 or M7 Top Plate, whereas the SRA7703 includes the M5 Top Plate. 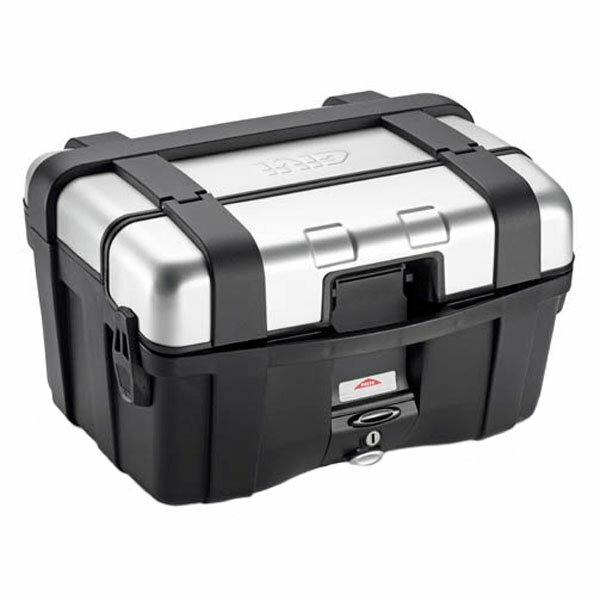 May we ask if you are going to use the TRK46N as a top case, or use a pair of panniers? If you wish to use it as a top case, you will require either the SR6043 or the SRA6403. Which mounting plate would I need for a 1990 Africa Twin rdo4 750 and how much is it thanks .